BORE PATH EXHIBITING AT UNDERGROUND CONSTRUCTION TECHNOLOGY 2017 – FORT WORTH, TX | Bore Path, Inc. Bore Path will be exhibiting at the Underground Construction Technology in Fort Worth, TX, January 31 – February 2nd. Find us at Booth #218 as we showcase the new Gyro Path®NSG. 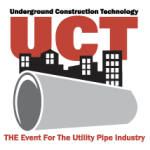 For more information on the Underground Construction Technology event please visit www.uctonline.com .